Hopefully it runs out well. It’ll be fine, congrats on a great score! Great buy IMO. For $300, I would have taken a chance on it. Even if you have to buy a new motor, you should still come out ahead. Original motor had been replaced and pulley’s don’t match, so i’m still working through that. I still have to button up the electrical, and I don’t care for the red base so I’m going to change that. 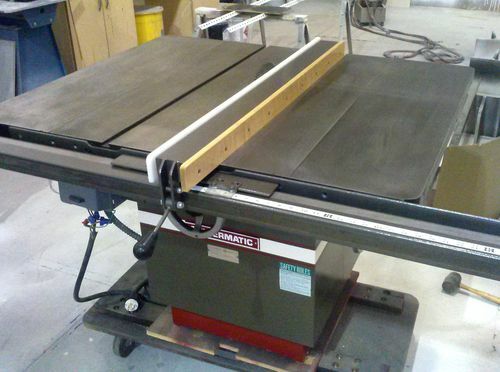 I may make a new base that is bigger than the saw box, like the new Powermatic saws have. I’d say it’s still a great deal. Good for you. Even a 3HP 12” saw is going to cut whatever you need…for the rest of your life…until you find something you want more…Congrats. I test cut 3 pieces of 3/4” PB glued together, cut right through without even slowing. All the gears and wheels turn smooth and easy, it’s still a good saw. 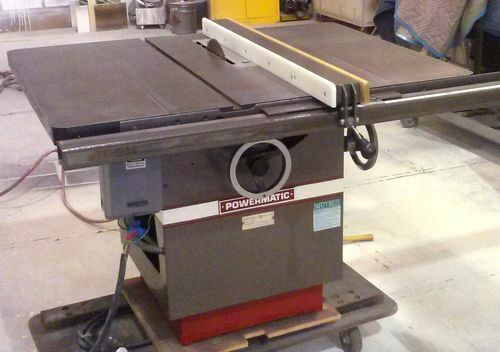 $300 for a 12” Powermatic is a steal even if it needs a little work. Run it with the 3HP motor a while. I’d be very surprised if you find a need to go to more HP. I agree the 3 HP is plenty big, but trying it for a while will confirm whether it suits you or not. I have 3hp Unisaw now. I was hoping to get the 5 hp for ripping bigger stock when needed. 3hp is good, but it’s not for everything.